Each month we host a Graphic Novel Book Club meeting, open to all, during which we hang out and informally discuss a featured graphic novel. 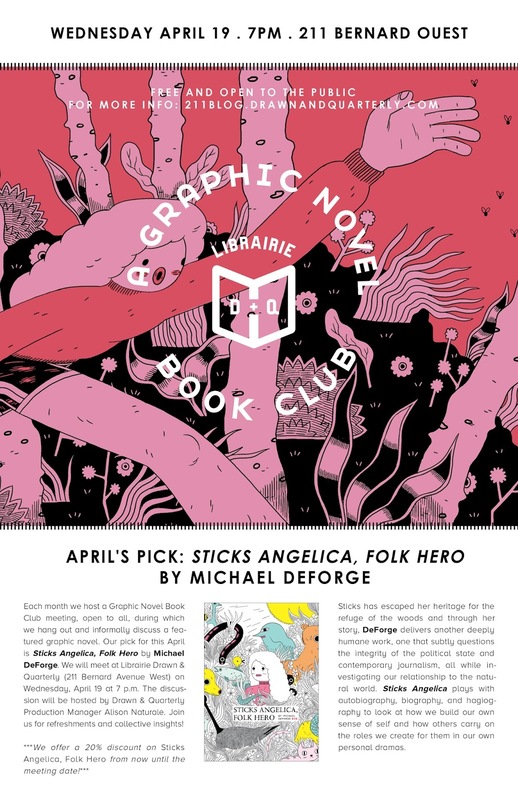 Our pick for this April is Sticks Angelica, Folk Hero by Michael DeForge. We will meet at Librairie Drawn & Quarterly (211 Bernard Avenue West) on Wednesday, April 19th at 7 p.m. The discussion will be hosted by Drawn & Quarterly Production Manager Alison Naturale. Join us for refreshments and collective insights! Sticks has escaped her heritage for the refuge of the woods and through her story, DeForge delivers another deeply humane work, one that subtly questions the integrity of the political state and contemporary journalism, all while investigating our relationship to the natural world.